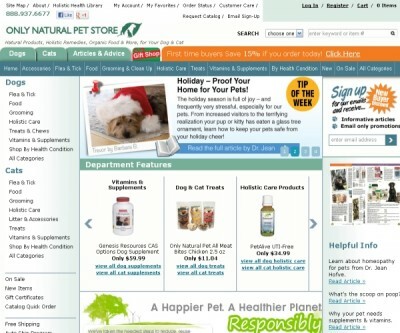 Only Natural Pet store was established in 2004 in Colorado and is an online store dedicated to natural pet product, organic foods and holistic remedies for pets. It offers natural supplements and flea control products, as well as a whole range of pet accessories designedto be safe for your pet as well as the environment without any cosmetic ingredientsand additives. Pet accessories are made from eco-friendly products and green manufactures. They use carbonneutral shipping and have a 100% wind powered manufacturing faculty using recycled paper for packaging. A dedicated support team which can be contactedboth by email and phone allows you in selecting the right kind of a product for your specific need. The site also has a large collection of articles in their Holistic Healthcare library section. You can also ask a question totheir online veterinary board of advisors. Their main range of products include flea and tick products, food and nutritional supplements, treats and chews as well as holistic health care products. You can also shop by a heath category and can choose from aromatherapy oils, flower essences, herbal remedies for various medical conditions for cats and dogs. The site offers free shipping on orders above $69 on a select range of product purchased from their website. You can also choose the product to be automatically delivered to your address at a choice of intervals. This enables you to make a one-time selection on periodic purchases such as food and grooming products, and they would be delivered as per the frequency you select. Not only does this save time, but you also qualify for a special discount on their products. For more information on this exciting range of organic and holistic pet products and nutritional supplements, please access their website at www.onlynaturalpet.com.